Infiniti’s racy FX37 sport-ute is a classic case for a love-hate relationship. If you enjoy performance, and don’t really expect such from a sport-ute, you’ve got to love how the FX37 responds. It feels like a tall Porsche, with oodles of power from its new 3.7-liter V6. In fact, Infiniti rates it a 325 horses and even that seems as if it might be a tad low. The 3.7 replaces the former 3.5-liter V6, which wasn’t too shabby itself. And the bright metallic blue test ute was the all-wheel-drive model, so right out of the blocks it had power and road grip on its side. Toss in a healthy helping of fine handling and the FX37 delivers premium performance at a modestly premium price. The base FX37 with rear-wheel drive starts at $44,950, while the tested AWD model lists at $45,750. And at that you get a silky 7-speed automatic with Adaptive Shift Control that allows you to shift manually. Where the hate comes in, and hate may be a bit harsh, is subject to one’s design leanings primarily. That, and depending on whether you expect a cushy ride, or one reflecting the sporty nature of this beast, you may feel luxury dictates the former. The design aspect primarily hinges on what you see from the outside, as the interior is attractively appointed, including maple trim panels in the doors and on the console that really give the FX37 an upscale appearance. But outside, there is a long hood with bulbous raised fenders. From inside, you almost feel you’re in a Porsche as you look over that hood. Yet many observers say that from the outside the Infiniti simply looks a bit off with those bulging fenders. I at least give it credit for NOT being another look-alike sport-ute. Plus there’s the firm, sporty ride from its four-wheel independent suspension. Riding on a 113.6-inch wheelbase you’d expect a pretty refined feel. Instead you get a sport sedan or racier vehicle ride, albeit well controlled. You feel the road’s imperfections much more pronounced here than in most luxury utes. Some also may argue whether this is more ute or crossover, but for me it’s so tall and feels so large that it falls squarely in the ute category. Plus there’s the AWD and 7.4 inches of ground clearance. You could take this through some thick muck. It’s no skinny Minnie either, weighing in at 4,299 lbs., and will tow up to 2,000 lbs. As such, and with that massive V6, you’d expect less than stellar gas mileage, and those expectations would be well founded. The EPA rates the FX37 at 16 mpg city and 22 mpg highway. In about 60% highway driving I netted just 16.1 mpg, while the trip computer put my mileage at 18.1. Sadly, the X37 drinks premium unleaded. 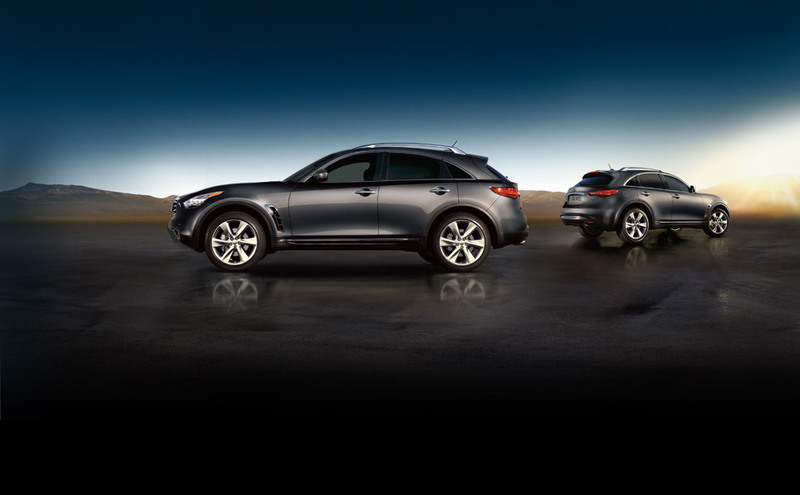 Braking comes from the expected four wheel discs, plus the Infiniti has stability and traction control. There also is a snow setting for the AWD, so you can lock it in if roads are particularly nasty. I only had to deal with rain-soaked streets and highways. The test ute insisted on adding all sorts of electronic wizardry, some of which is appreciated and some less so. All told the three option packages, plus $950 delivery, pushed the FX37’s cost to a $57,240 gold standard. What you get for that is the technology package with the annoying Lane Departure system that beeps every time you get near a painted lane marker on either side of the vehicle. Fortunately you can turn it off with a button low on the left side of the dash. Sadly, it defaults to on, every time you start up the ute. Other goodies in that package include Intelligent Brake Assist with Forward Collision Warning that uses sonar to detect a vehicle in your lane that may be slowing more quickly than you’ve adjusted for. There’s also adaptive front lighting, rain-sensing wipers, front pre-crash seatbelts. Oddly, there is no blind-spot warning system though. The center stack is button crazy. That Tech package runs $2,950 and mates well with the $4,300 premium package that adds Around View which shows on your dash touch-screen what’s around each side of the ute. This view shows up right next to the backup camera display, showing what’s directly behind you. The package includes an 8-inch color monitor, voice recognition, navigation and the clever NavTraffic and weather, along with a restaurant guide. That NavTraffic shows you in red, yellow or green, if the highway you’re approaching, or already on, is moving freely or has a blockage.I also like the power tilt/telescope steering wheel that’s part of the package. That wheel powers back and away when the ignition is off, allowing for easier vehicle exits. The deluxe touring package also upgrades the seats to quilted leather with three-level heating and cooling in the front seats. These are delightfully well contoured, again reflecting the sporty nature of this ute. Also part of the $3,3,00 package are 20-inch aluminum alloy wheels to add some bling, along with the maple trim and a folding cargo cover. 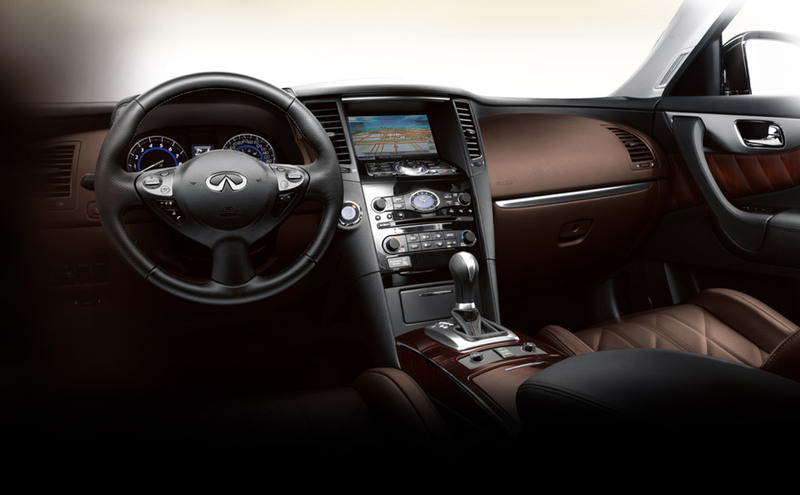 The FX37 has a gorgeous interior with maple trim. I didn’t care for that cover. It rattles and actually makes it hard to load in more than a couple of suitcases. Leaving it in place I had to fold down a portion of the split rear seat to haul three suitcases to the airport. Obviously you can pop it out, but the real problem is how tall the cargo floor is, exactly level with the rear bumper, with a spare tire below the floor. Compared with many utes, this cargo area is small. I do like the power hatch though.There were a few other drawbacks to the Infiniti’s interior. First, the center stack is typical luxury vehicle button crazy. Not all are simply marked, so use while driving can be a bother. The ute’s A pillar also is huge, especially with large rearview mirrors mounted next to the pillars. Add to that the interior rearview mirror, which rides way too low on the windshield, somewhat blocking your view. All this is what stirs the hate portion of this love-hate relationship I have with the FX37. I love its performance, and the fact it isn’t a look-alike ute. But there are more than a few drawbacks. Consider all of the above when you shop for one. One final note, and this is for the folks who love the FX’s look, but feel 325 horses may be insufficient, although that’s hard to imagine. 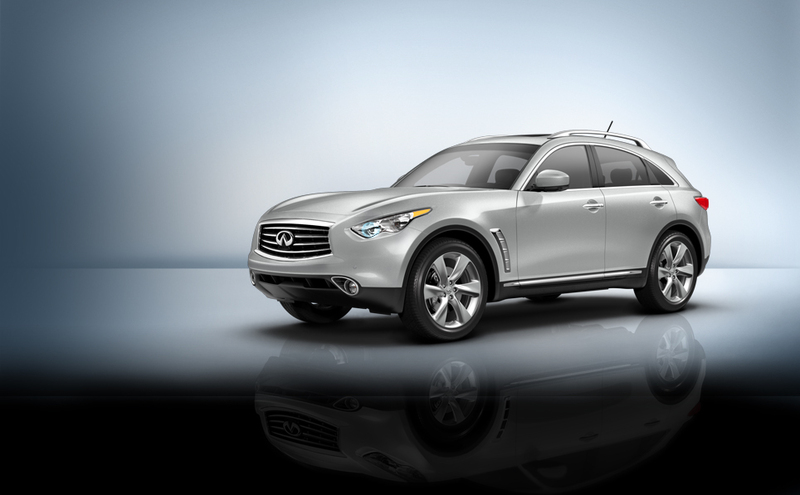 Infiniti also offers the FX50 AWD with a 5.0-liter V8. It pounds out 390 horses, but lowers its EPA rating to just 14 mpg city and 20 mpg highway. Obviously money is not a concern at this point. The FX50 lists at $61,500. Hits: Superior power and handling for a ute. Feels like a tall Porsche. Attractive interior with classy maple trim, sporty well-formed heated/cooled seats and power tilt/telescope steering wheel. Has a power hatch in back and backup camera. Misses: Beeping lane departure system is annoying, as is button crazy center stack. A pillar is huge and rearview mirror is way too low. Not much cargo space for a ute and the folding cargo cover is less than convenient and rattles. Bulbous looks can be off-putting.